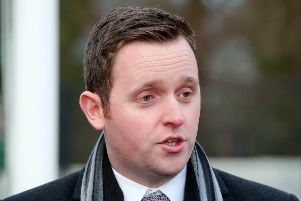 A leader of the SDLP’s youth wing has said little has been done to dispel fears about the party’s still “vague” partnership with Fianna Fail. Matthew Corr said questions remain about how the planned link with the much larger Dublin-based party is actually going to work, after the SDLP and Fianna Fail announced last Thursday they will embark on a “partnership” – as opposed to a much-mooted merger. Mr Corr, chairman of SDLP Youth, told the News Letter he knew nothing more about the plans than what was declared at the press conference. “In August 2018 SDLP Youth voted to oppose any merger or working arrangement with any party whose values and principles are contradictory to those of the SDLP,” he said. “This has not changed. We are concerned about the uncertainty of this process and are uneasy voting on such a vague proposal on the future of our party. “Back in the summer of 2018, Colum Eastwood said: ‘The future of our party lies in the ability and enthusiasm of our youth wing’. At last week’s press conference SDLP leader Mr Eastwood said the two parties will embark on “an unprecedented programme of public engagement” to prepare proposals on education, Brexit, “unity of our people”, and more. “In each area, the work will be linked to a public forum and followed by the publication of specific recommendations,” said Mr Eastwood. What are some shared policies between the parties? ; Who decides this and how? ; Will Fianna Fail have a role in selecting SDLP candidates? ; Are the SDLP’s fraternal links to the UK and Irish Labour parties now severed? ; And will Fianna Fail and the SDLP share financial resources? It did not answer, with a spokesperson saying the detail is to be shared with SDLP members first rather than the media, adding that documents are to be sent to SDLP branches. He “had not seen anything” about whether Fianna Fail and the SDLP will share funding. SDLP members are set to meet in Newry on February 9 to vote on endorsing or rejecting the partnership.